The buckeye state has many options for Ohio Medicare supplement insurance plans (also known as Medigap). The rates can vary depending on plan coverage and your geographic location. The good news is that QuoteFinder.Org has several local agents who can help you with questions on the various Medicare supplement plans being offered. Ohio is one of the most popular states to purchase Medicare supplement insurance because it is one of the most affordable states to obtain coverage. For many Ohioans turning 65 it is their only chance to obtain this quality of Medigap coverage at a preferred rate. Plan F is the most comprehensive plan, but Plan G is very similar and often presents a great deal of savings to the consumer. Plan N is usually, the most affordable, but the value may not seem as good as what Plan G has to offer. Simply, fill out a Quote Request to see the plan prices. Ohio has no shortage of Medigap Companies offering coverage. However, a few companies stand out as being the most popular. Choosing the correct Medigap insurance is very important. Everyone who enrolls in a Medicare supplement works with an agent. The agent can explain spousal discounts and the rating systems that different carriers use. We strongly recommend working with a company that is well known. The Medicare insurance industry is very large. 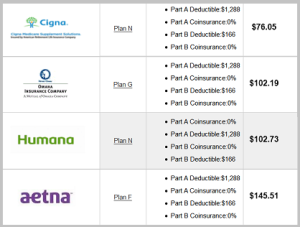 For example, at QuoteFinder.Org we work with 68 different companies that offer Medicare. Some are better for a Wife, some are better for a Husband, some are better for a Husband and Wife. Our years of experience can help everyone save time and money. What Medicare Supplement Plans are available in Ohio? We strongly suggest that you contact one of our Ohio medicare agents. Through our years of experience, we have learned the sooner the consumer contacts us the happier they are with their overall Medicare experience. It is no cost to work with our staff. We are licensed by the Ohio Department of Insurance and paid by the insurance companies. We guarantee the lowest rates on Ohio Medicare supplement insurance. Request Your FREE Medicare Quote NOW!